Much of today’s Valentine’s Day expectations were created by the Victorians. While sending and receiving Valentines had been fairly commonplace before the 19thcCentury, it was the Industrial Revolution’s advances in paper making and printing which greatly reduced the cost of the traditional, small, and elaborate Valentines. Machine made paper and new printing processes and techniques allowing for combined colors (chromolithography), metallic inks, and die-cutting worked together to decrease the price of Valentines. 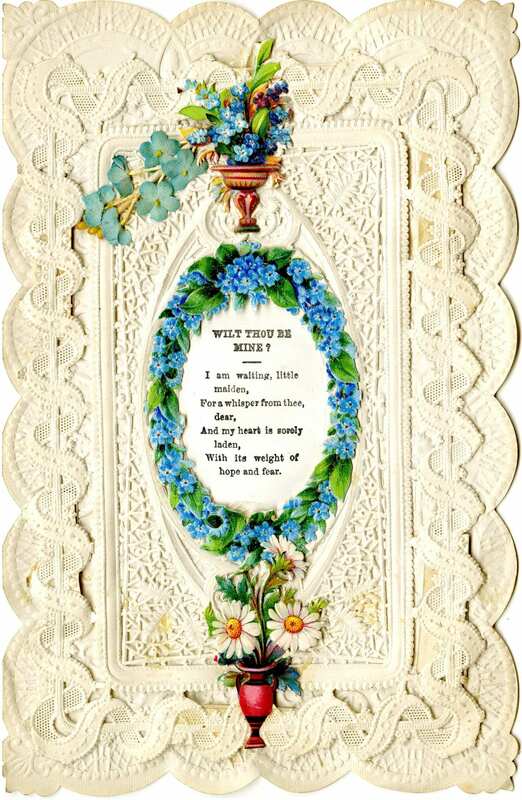 Victorian Valentines could be purchased ready-made or senders could create original assemblages of materials available from a stationer’s shop. These items included paper lace, mirrors, bows, ribbons, seeds, sachets, gold and silver foil appliques, silk flowers, die-cut mottos or designs, and other items. Additionally, postal pricing reform recommended by Rowland Hill in 1837 and fully adopted in Britain in 1840 with the introduction of the Uniform Penny Post incentivized mass production of Valentines. The growth of Valentine’s Day’s commercialization is clearly demonstrated in the increased sending of Valentines as tracked by the British Post Office. Its records indicate that up to 60,000 Valentines were sent in England in 1836. After the introduction of the Uniform Penny Post, 400,000 Valentines were posted throughout England in 1841. 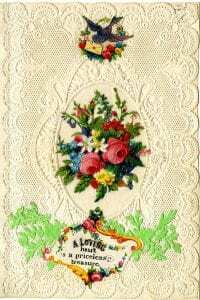 The numbers continued to climb, with 542,000 Valentines mailed within London in 1865 and nearly double that amount were sent into London from the surrounding countryside. These numbers led to Victorian postmen receiving a special allowance for refreshments to help them keep up their energy in the 2-3 days leading up to February 14th. “Valentine’s Day; ‘Oh! Here’s The Postman! 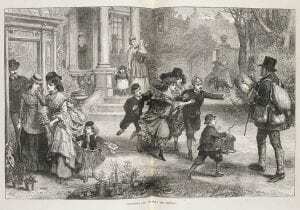 '”, The Illustrated London News, February 10th, 1872. From the British Library’s Collections, Copyright British Newspaper Archive. 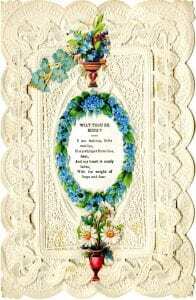 A four page PDF with scans of Victorian Valentines from the Armstrong Browning Library’s Victorian Valentines Collection. Two pages are a classic layout of 9 cards to print and cut out. One page has 4 horizontal designs with a back and front that can be printed, cut, and folded in-half as a card. One page has two vertical designs with a back and front that can be printed, cut, and folded in-half as a card. If you would prefer individual pages as a JPG file: classic layout page 1, classic layout page 2, horizontal designs, and vertical designs. This entry was posted in Uncategorized by Laura French. Bookmark the permalink. Thank you for this lovely article, and for the printable Valentines!